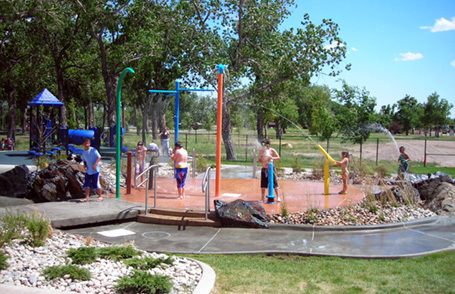 The City of Cheyenne, Wyoming, affectionately nicknamed“Magic City of the Plains” undoubtedly created magic in the new Lions Spray Park. The team of Counsilman-Hunsaker and architects Lyman Davidson Dooley designed this spectacular sprayground with interactive water play elements. Lions Spray Park’s guests are welcomed by jumping jets of shooting streams of water, directional jets sending water arches outward ten to 20 feet, ground aerator sprays producing large eruptions of foamy water, while the deck pop jet discharges a ball of water directly into the air. Numerous pine trees lend a dramatic backdrop while boulders create an adventurous setting where youngsters zip around the water wonderland. The 17 bright play structures include large above ground water sprays and smaller flush-mounted water equipment. Also included are restrooms and concessions. This lively park enhancement offers families an exciting and refreshing new way to enjoy Lions Park. Measurable Results! Within the first 31 days of operation there were nearly 5,000 users, an average of 160 per day. The adjoining pool saw a 15% increase in users as a result of the spray park.